We work in an expanding field, in which all definitions of practices, their supports and their institutional frameworks have shifted and blurred. But the fact that we have all left our constraining definitions behind, that we all take part in multiple practices and share multiple knowledge bases, has several implications. On the one hand the dominance of Neo-Liberal models of work that valorize hyper-production have meant that the demand is not simply to produce work, but also to find ways of funding it, to build up the environments that sustain it, to develop the discursive frames that open it up to other discussions, to endlessly network it with other work or other structures so as to expand its reach and seemingly give it additional credit for wider impact. So in this context the expansion is perceived as a form of post-Fordist enterpreneurship. On the other hand the dominant transdisciplinarity of the expanded field of art and cultural production has entailed equal amounts of researching, investigating, inventing archives from which we can read in more contemporary ways, finding new formats, self instituting, educating, organizing and sharing. Most interestingly, it has dictated that each idea or concept we take up must be subjected to pressures from other modes of knowledge and of knowing – it cannot simply stay within its own comfortable paradigm and celebrate itself and its achievements. 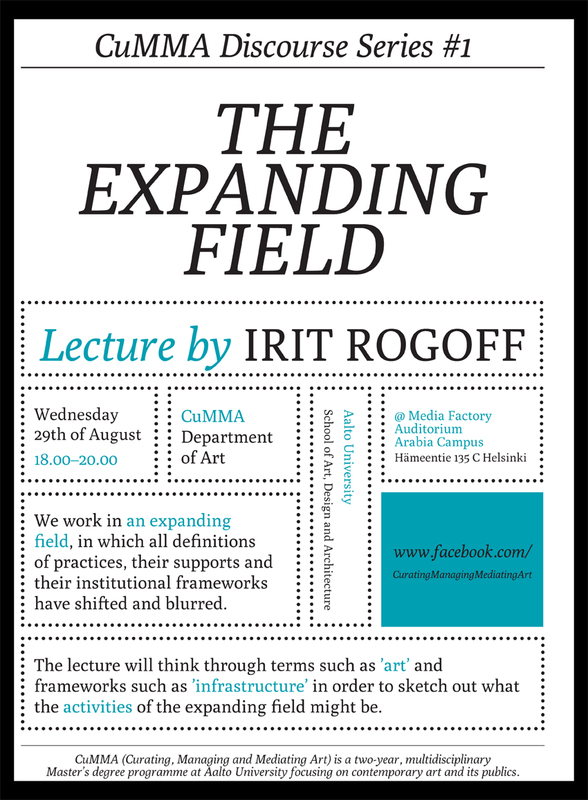 And so in this other context, the expanding field is one of broader contemporary knowledge bases and practices. Seemingly in each of these two cases the emphasis is on ‘more’, but in order to come to terms with this duality which is often less than compatible , I need to think through what has happened in the field recently and of ways this might or might not be quite the opening up or loosening up, we had previously thought. This presentation will think through a set of destabalised terms such as ‘art’ and a set of emergent frameworks such as ‘infrastructure’ in order to sketch out what the activities of the expanding field might be.